1, 2. 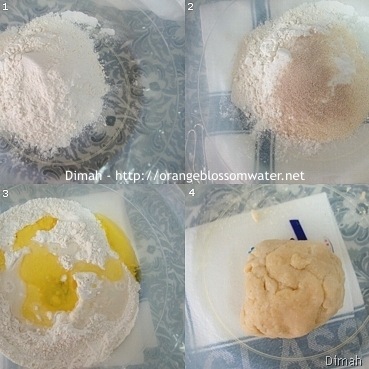 Combine flour, fine semolina, sugar, instant yeast and salt in a bowl. 3. Add melted ghee, and water. 4. Mix until combine and knead until all the ingredients come together. 5. Take small piece of dough. 6. Form the piece of the dough into a shape similar to dates. 7, 8, 9, 10, 11, 12. 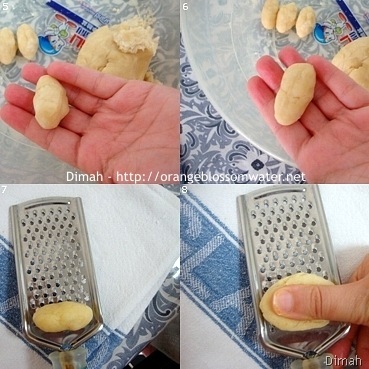 By your finger press the piece of the dough into the sharp side of the grater and roll it. 13, 14. Spots will be created by the grater on the piece of the dough. 15, 16. Make all the quantity of the dough, and let the pieces rest for about 10 minutes (I didn’t keep them to rest for 10 minutes because they had already rested while working with all the quantity). 17, 18. 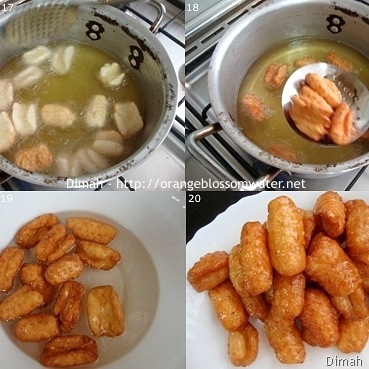 Deep fry in hot oil until golden brown in color. 19, 20. Dip in cold sugar syrup, then remove them. I added 7 tbsp of lukewarm water to the dough. You can flavor the dough by adding cinnamon powder, or anise powder. 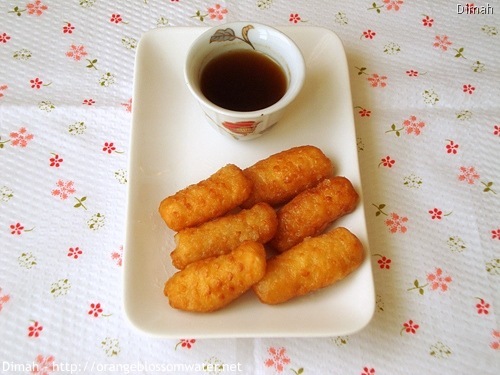 I made the sugar syrup similar to the recipe (Sugar Syrup). Cold sugar syrup is added to hot desserts. Hot sugar syrup is added to cold desserts. 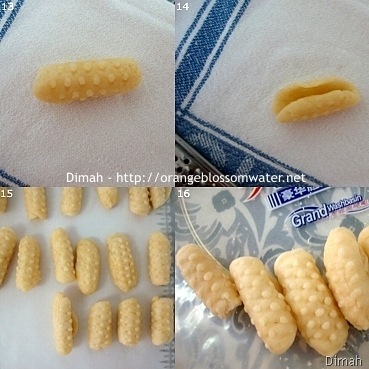 This entry was posted on Friday, October 22nd, 2010 at 5:50 PM	and is filed under Arabic Baking and Desserts. You can follow any responses to this entry through the RSS 2.0 feed. You can skip to the end and leave a response. Pinging is currently not allowed. In Lebanon we call this maakroun! Mom used to make them. Yours look wonderful!! You make these so well~ in Lebanon we call them macaroons and they are heavily flavored with anise. 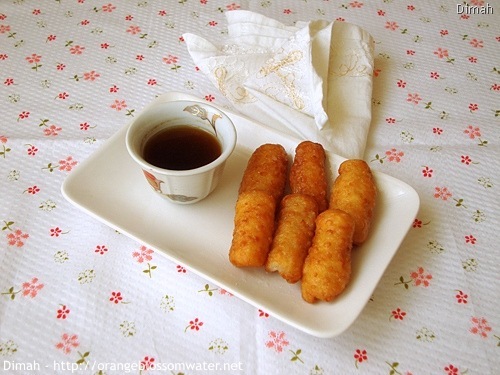 So good with that Turkish coffee there! My family makes a dessert similar to this too. Thanks for sharing. Hmm yumm yumm, looks so tempting. I tried your kibbeh came out really well, we all loved it. Looks perfect and really delicious! these look fantastic. it reminds me of something my grandma used to make for us. any deep fried dough sounds good to me. i am going to save this recipe. thank you for sharing. have a nice weekend. Fried dough? I can totally go for some of that. Ingenious method for texturizing the dough! 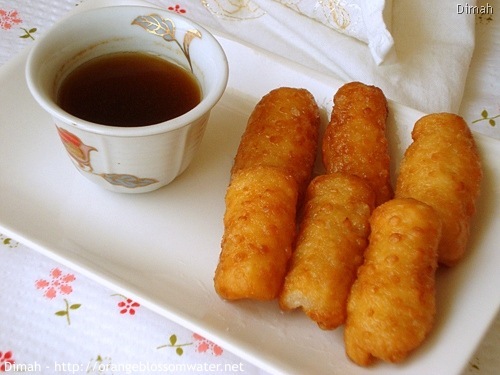 This looks soooo yummy..perfect finger food and the name also says fingers. Lovely dish. Snaps are great. Thanks for visiting. This is a new dish for me – one that I would love to try. It’s very unique and special! I bet these just melt in your mouth. I could probably eat a dozen. These look wonderful! I would definitely have a hard time keeping away from these and not eating them all at once! These look delightful! And an act of love to make. I want to try them. This looks great to me, so delicious, I’m sure! And very interesting with the grater for design and texture. Way to go! O, my husband would go nuts for these! They look so crisp and airy! These dessert looks cute and delicious. I like idea of using the grater to make designs. Thanks for visiting my blog. I love middle eastern food. Sure following you to find more recipes. This is absolutely exquisite. 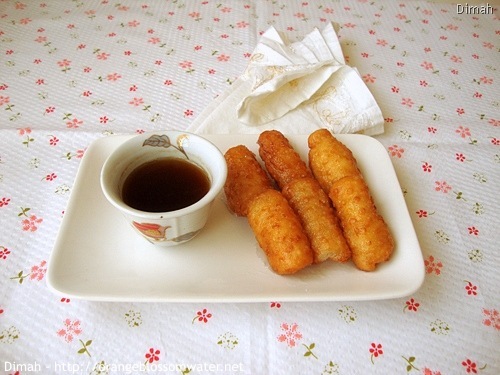 Somehow they look light – even with the deep frying. Gorgeous blog. Must follow! 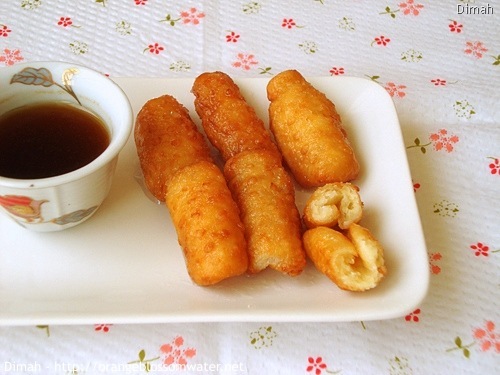 Seems like every culture has their version of fried dough…from donuts to these little treats you made. 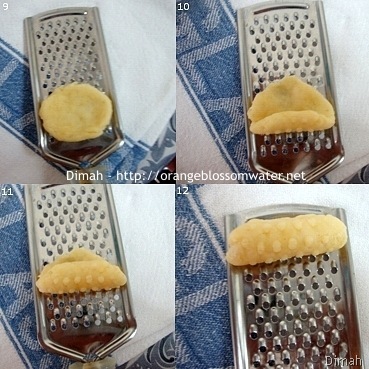 I love the little spots created by the grater. BTW, I tagged you over on my blog, I don’t know if you saw that. I’ve never seen this dessert before -thanks for sharing! THis is new to me! Thanks for sharing. These treats just look so tasty and delicious. The tea I am drinking now seems like it is missing the company of just such an addition to make it perfect. Cherine: Thanks for the lovely comment. I know that in some countries it is known as “macaron” but I preferred not to mention that because the name is similar to American Macaroon or French Macaron, some letters in Arabic can’t be written as pronounced like letter “E’in” which is in the word “Ma’caron”. Hannah: Thanks for stopping by! blackbookkitchendiaries: Thank you so much! 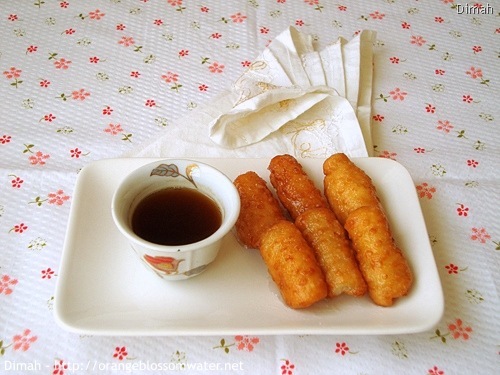 I love deep fried dough, many desserts in middle east are deep fried dough, yum! Reeni: Thanks for the kind comment! Lorraine @ Not Quite Nigella: Thanks for stopping by! OysterCulture: Thanks for the lovely comment! This is one of our favorite desserts. We call it vezir parmagi in Turkish which means vizier’s finger. Yours look fantastic! 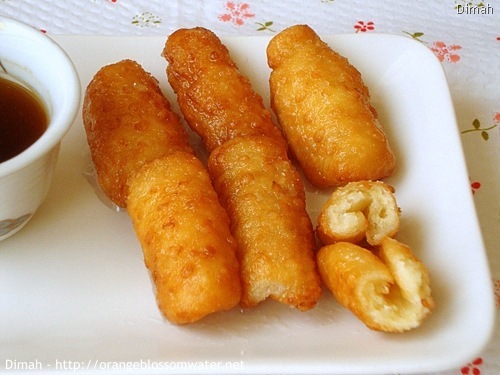 Mmmmhhh, I love deep-fried treats! Those “fingers” look so good. I have had Asabe Zainab a few times but when u buy them, usually contain rose water n i dont like that taste in my food! but since this is without essence, i’m sure it will be very tastey =) Actually, i have been trying to put u on my blogroll but the link is not working =( is there some issue? What a lovely middle eastern dessert. Thanks for sharing! Those look very unique and delicious. 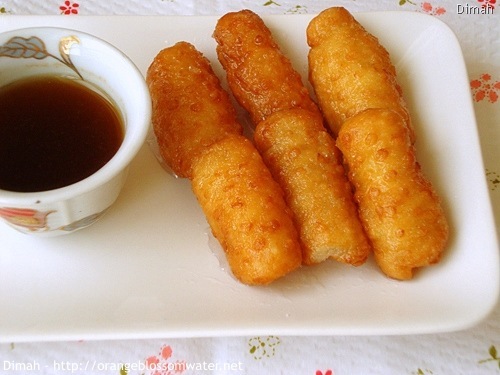 They remind me of certain Indian desserts…in that they’re fried then dipped into a syrup. sameena: Thanks for stopping by! Ellie (Almost Bourdain): Thank you! This recipe is mouthwatering. I’ve done it twice with my mother this Ramadan and she really enjoyed it as well as my family members. 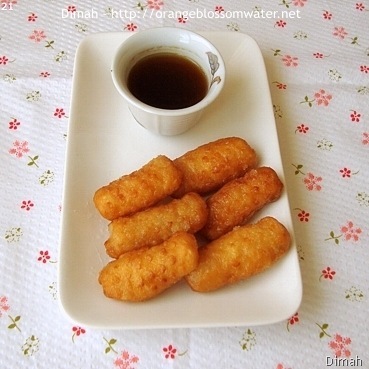 This will be my go to Asabe Zainab recipe from now on. Jazaka Allahu Kheiran Dimah! Ramadan Kareem and greetings to your Mom.